This is an exploding box of Easter delights. I made it for my darling husband. 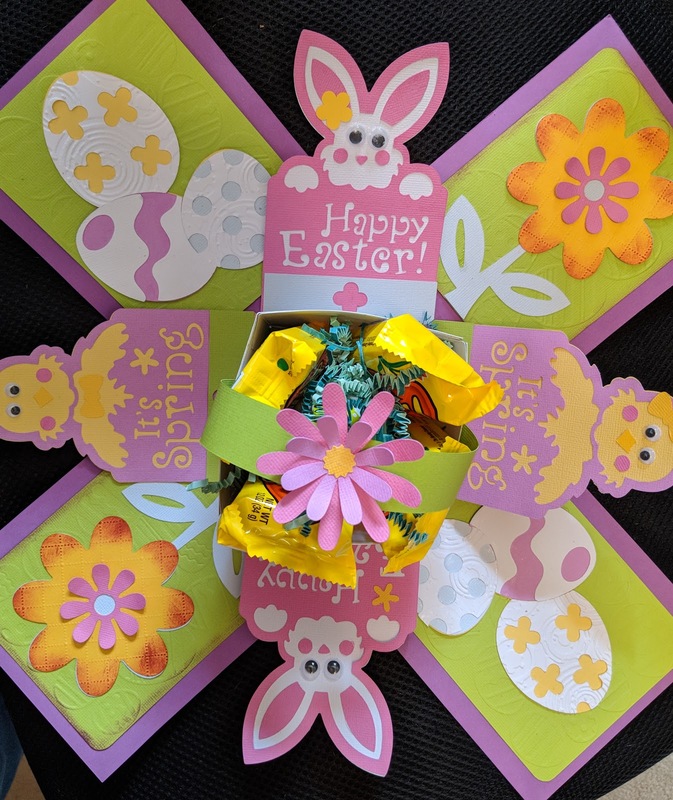 We've been married for 16 years, but we still put together Easter baskets for one another. It's our silly not-so-grown-up tradition. 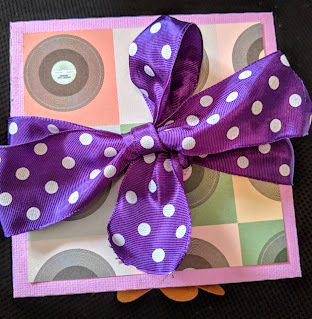 I found the pattern for this Easter Explosion Box on the Dreaming Tree website. It looked so complicated that I initially was afraid to try making it. Dreaming Tree, however, released a free bunny Easter card pattern. 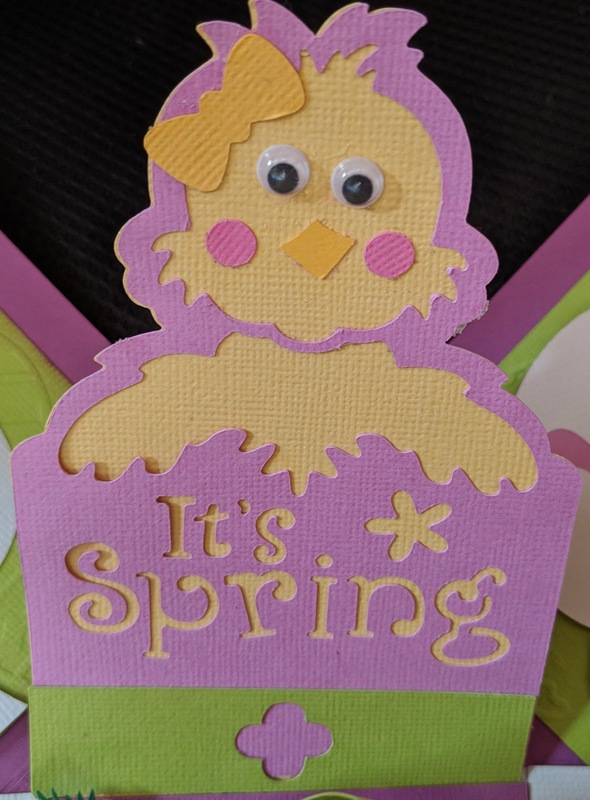 I tried making that card one afternoon. 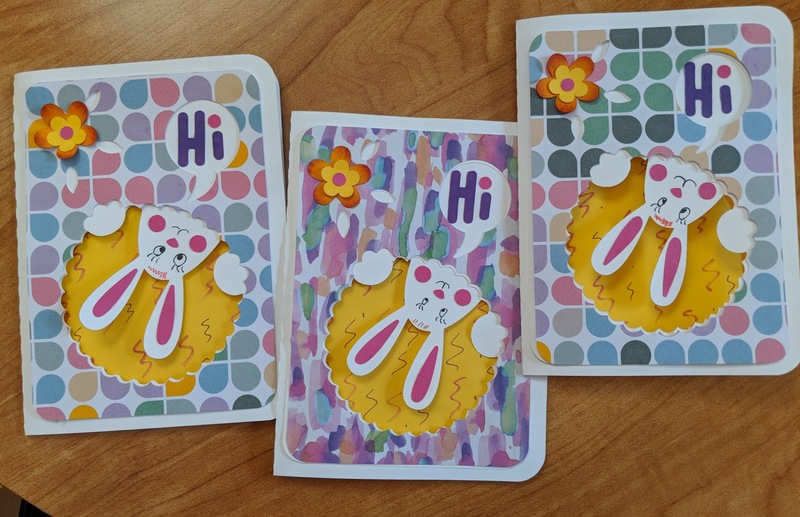 The next thing I knew, I had three adorable bunny cards. 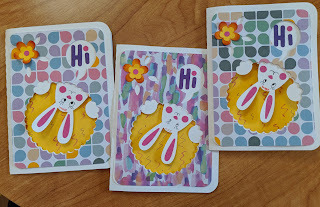 I had such fun making those bunny cards that I decided that I needed to purchase the pattern for the exploding box. Until I saw the pattern, I don't think that I had even heard of a decorative exploding box. Basically, one pulls together all of the little pieces and puts a lid on the box. Then, when the lid is removed, all of the goodies flutter freely. The box wasn't particularly hard to make, thanks to the detailed YouTube video available on the Dreaming Tree website. Two sides of the box exterior have large yellow and green flowers. I used my embossing machine to emboss a crisscross design on each of the flowers. 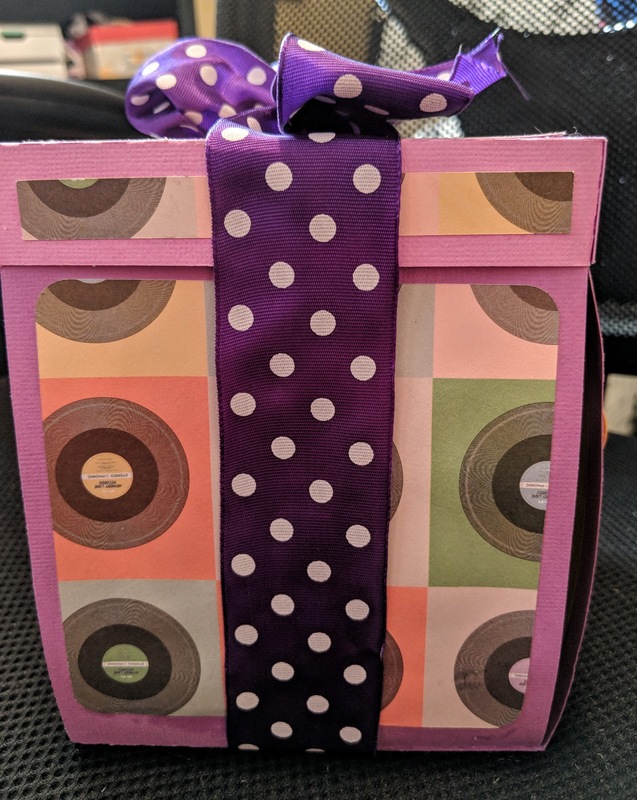 The exterior of the box features a retro vinyl design. I inked the flowers with a bit of brick red ink. Pardon the crooked lid here. It looks like I didn't get it on completely before I took this photo. Still you get the gist of the design. The other two designs are the plain vinyl card stock. I embossed the green paper inside the box as well. 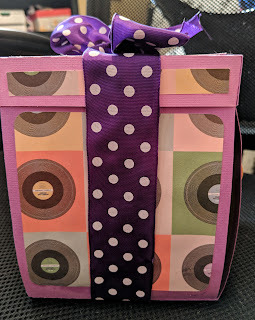 I used a swirly designed embossing folder. I wish I had used the crisscross design on those paper pieces as well, but the swirls are OK. 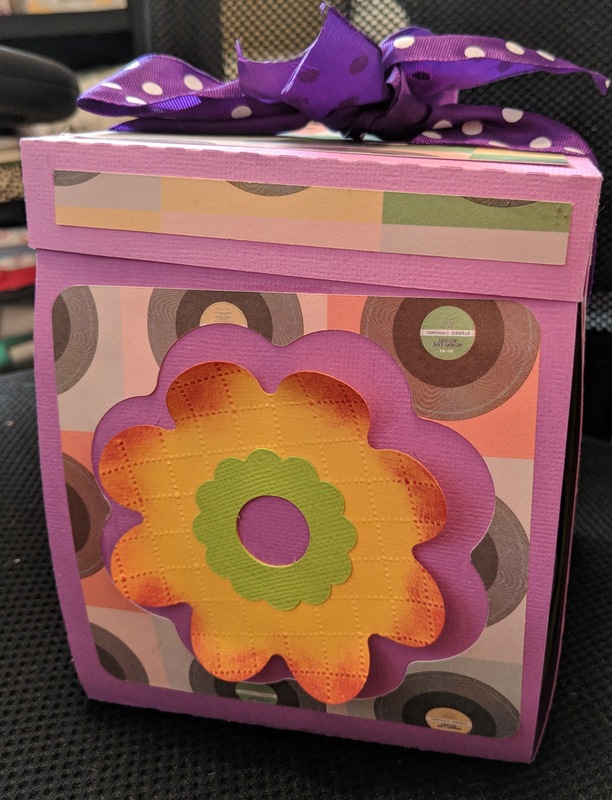 I also inked the flowers inside of the box and part of the green paper. I decided that I didn't like the look of the ink on the green paper, so I didn't do it on all of the green. After the project was completed, I think the ink looked OK. I probably won't try using a purple ink on green paper ever again, but hey, lesson learned. 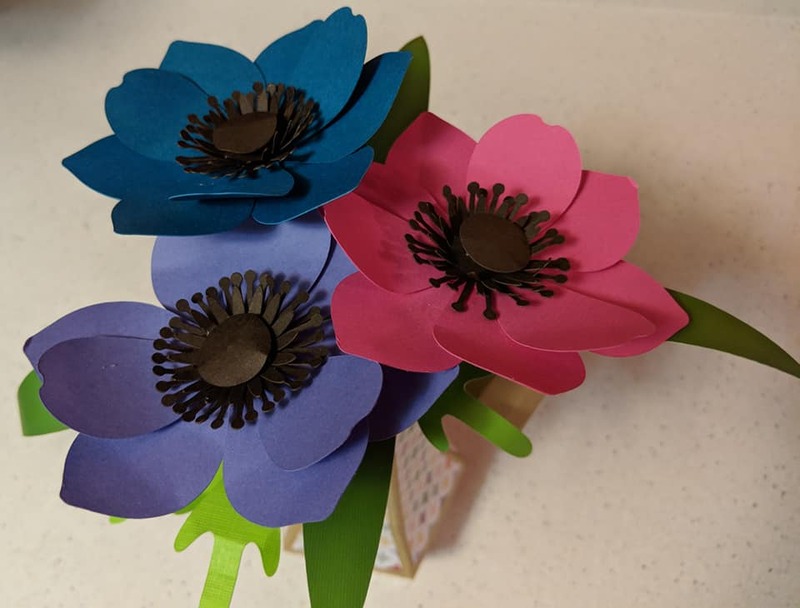 The only major thing that I regretted about this project was that I switched to a different glue from what I normally use. I used Scotch Quick-Dry Tacky Glue. This is the glue that is recommended by Dreaming Tree crafters as well as tons of other people. I thought, "How can I go wrong?" The great thing about this glue is that it works fast. You don't need to spend a lot of time holding your paper in place in order for the glue to take hold. The downside is that the glue leaves a shiny residue that is impossible to remove. That's no big deal if you've got supreme gluing skills. I, however, am not a master gluer. I use glue a bit like a 5-year-old. So, if you look closely at the little critters inside the box, you'll inevitably see shiny specks of glue. 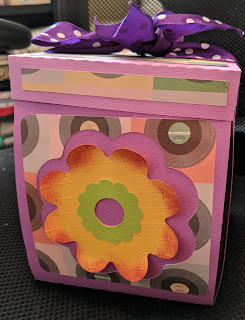 The glue spots annoy me, but I didn't notice the issue until I had finished most of the box. At any rate, I think I'll be going back to rubber cement for most of my paper projects in the future. It doesn't dry as quickly as the Scotch glue, but I can rube off the dried glue with an eraser so my project will look more professional. Still, I'm pleased with the project overall. Now that I know how to make an exploding box, I look forward to making more boxes with different themes. At the end of the day, I learned a few new things.